TV show dates: August 22, 2014 — present. Performers include: Will Arnett, Amy Sedaris, Alison Brie, Aaron Paul, Paul F. Tompkins, Adam Conover, Raphael Bob-Waksberg, Kristen Schaal, Angela Bassett, Patton Oswalt, Maria Bamford, Keith Olbermann, Stanley Tucci, and J.K. Simmons. A dark, animated adult comedy, the BoJack Horseman TV show centers on BoJack (Arnett). This middle aged horse starred in the family sitcom, Horsin’ Around, back in the 1990s. When the story begins, he’s all washed up and wants to make a big comeback. After his fame faded, a whisky-fueled BoJack wallowed in self-loathing and romantic failures. Finally, with the support of his human sidekick Todd (Paul) and Princess Caroline — his feline agent and ex-lover — BoJack is ready for his second chance. BoJack’s longtime perceived Hollywood rival, Mr. Peanutbutter (Tompkins), is a cheerful yellow Labrador Retriever. 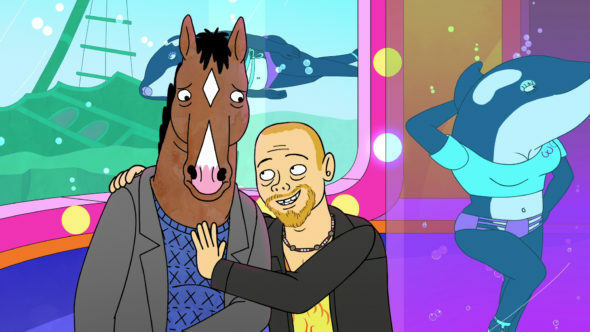 He’s also involved with BoJack’s biographer, Diane Nguyen (Brie). Eventually, BoJack lands the role of Secretariat in his dream film. This accomplishment inspires him to put past humiliations behind him and become a better BoJack. Will he ever really make a substantial change? Stay tuned. What do you think? Do you like the BoJack Horseman TV series? Should this TV show be cancelled or renewed for another season on Netflix? More about: BoJack Horseman, BoJack Horseman: canceled or renewed?, BoJack Horseman: ratings, Netflix TV shows: canceled or renewed? I am a big fan of the humor and how deep the show can get. I find that the characters are written with complex personalities, which can delve into some dark places. It is not afraid to get real. It has the key elements to a good show. It gets to your emotions at times, which can really help connect a veiwer, but it always has the humor to provide a wideset range of things to enjoy. It truly is Bojack’s book in show form and is DEFINITELY renewable!